When studying journalism some 25 years ago we used to talk about ‘News induced crime waves.’ As a publisher, to create the illusion that the crime of, say, snatching handbags from grannies is on the increase, all you need to do is increase the number of instances you report on it. 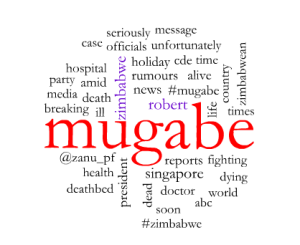 The recent Mugabe health scare, whether true or not, has shown how social media has amplified and grown a report from a single, unsubstantiated source. Using Radian6, we can tell this interesting tale. Radian6 collates all the publicly available mentions of a specified keyword across the Internet. We simply used the keyword ‘Mugabe” and set the parameters for the last 7 days. 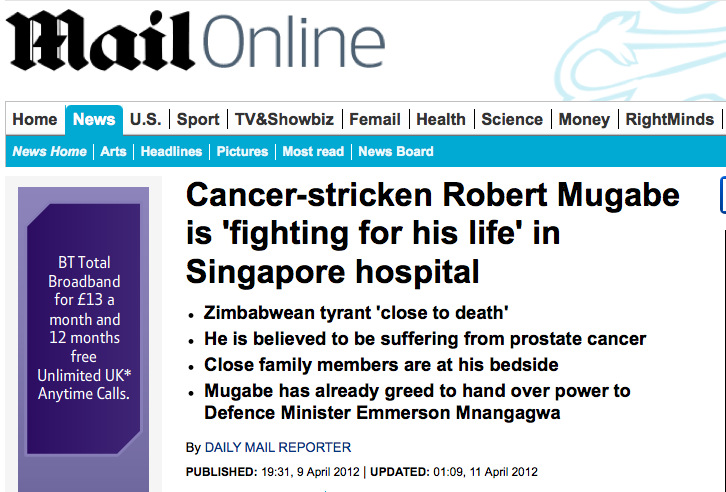 The global comments went from an average of between 500 to 600 a day to 8,712 on April the 9th when The Zimbabwe Mail published ‘Mugabe battling for life in Singapore‘ on their website in the closing hours of the 8th of April. The story was immediately picked up by Zimbabweans and journalists across the awake world, with Australia, who had just woken up posting it on social networks and in their local press. 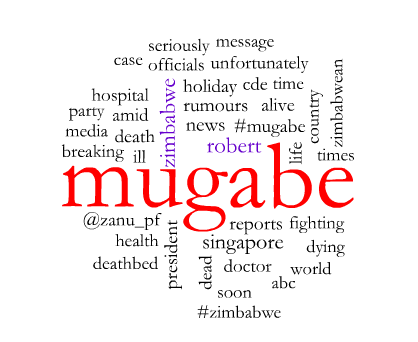 The interest spread from there, fueled largely, we believe, by the fact that #Mugabe became a ‘trending topic’ on Twitter. What is interesting is that most of the mainstream news articles that carried the story quoted a single source, the original Zimbabwe Mail story, which quoted an ‘unnamed source’. 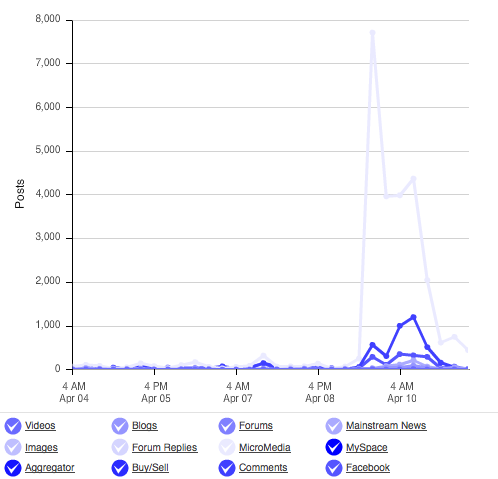 With the 9th of April being a public holiday in many commonwealth countries, and the fact that Zimbabwean officials did nothing to prove or disprove the story, the interest spread across to Tuesday the 10th when many people returned to work, and therefore their Internet connections to discover and extend the life of the rumours. 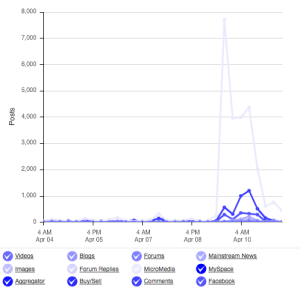 Another interesting trend is that interest started dying down on the 10th of April, but rose again on the 11th as the Zimbabwe government spokespeople started to deny the rumours. Watching and analyzing the content on Twitter and on mainstream news and comments we see an endless cycle of speculation and recycled news and opinion. We wait to find out what is really going on, but what is clear is citizen journalism, in this instance, has done nothing more than fuel speculation and rumour. Mugabe is the master at keeping people guessing and controlling the news content around him, leaving us very little to feed off. Well, this goes to show that there are problems with citizen journalism. a lie/half truth can spread. and there is no story development but a retweeting of the same, no analysis, just spreading a lie. Professional journalism is thus here to stay. It’s all the more important that rumors and news, whether true or not, be addressed by the subject as soon as possible. Like you showed by tracking the Mugabe Fiasco, there doesn’t need to be a credible source for information to be shared and spread. It makes one wonder if there were other motivations behind publishing the story in the first place. As far as the comments about “Citizen Journalism”, is this to say that it is bad? Great question re citizen journalism. Citizen Journalism has the potential to transform societies. It has taken the power out of the hands of a few and put it back in the hands of communities. Citizen journalism is good and it is powerful. However, in this instance we can learn from its limitations. And it does have its limitations. We can put blame on some irresponsible reporting from mainstream news channels and the failure of journalists to spend some effort in confirming the story, or seeking out alternative methods of finding the truth. However the explosion of activity over Twitter and Facebook certainly helped fuel the rumour and bring it to mainstream attention. Citizen journalism works when people are empowered to add value to a story, or contribute facts and real-time feeds from the field. For example, in the case of a natural disaster, or a revolution, contributions from real people witnessing real events, right in-front of them brings instant news right to our social media feeds. Hashtags on Twitter help us filter out the noise and keep up to date. If we had people on the ground in Singapore sending through photos and instances of sightings, or a nurse from a hospital leaking information, that would have been different. Instead we got an endless stream of recycled news, speculation and opinion. Just as with mainstream journalism and reporting, we have to have context around the sources of information. Taking a report that comes to you over social media without a deeper look at the context around that source is considered to be dangerous. Just as you would take an entry in Wikipedia as a starting point or an opinion and not necessarily the truth, so too do you need to do so with social media. Credibility of content and truth are imperative for anyone who wants to be taken seriously online.